Franklin Street Works presents a free, public media studies panel at the Ferguson Library Main Branch on December 2 from 4-5:30 followed by a wine reception at Franklin Street Works from 5:45 – 7:00. For the panel — moderated by New Haven artist and Franklin Street Works guest curator Jeff Ostergren — scholar Jack Bratich, journalist Alexandria Neason, and artist Alexandra Bell will explore media studies topics that connect to some of the themes in Ostergren’s exhibition, “False Flag: The Space Between Paranoia and Reason.” The group show is on view at Franklin Street Works through Jan. 6. 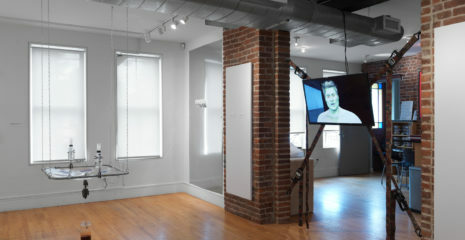 Bell is a Brooklyn-based artist whose work explores media bias; Bratich is an Associate Professor in Journalism and Media Studies at Rutgers University and the author of “Conspiracy Panics: Political Rationality and Popular Culture” (2008); and Neason is a Columbia Journalism Review staff writer and former Village Voice reporter. The panelists will bring an on-the-ground perspective to the panel while Ostergren will connect larger themes to his curation of “False Flag” and discuss how contemporary art can bring alternate perspectives to dominant narratives. We are excited to partner with the Ferguson Library on this timely event! Stay tuned for updates on panel themes and more. RSVPs are not necessary but they help us plan. Please RSVP to info@franklinstreetworks.org.